In January of 1964, the Beatles were in Paris, staying at the five-star hotel, the famous Georges V. They were staying there during the 18 days of concerts they were giving at Paris’ Olympia Theater. This was to be the last concert residency of the Beatles before they made their legendary first trip to America to appear on The Ed Sullivan Show in early February. John and Paul had an upright piano sent up to their room for them compose new songs on. In these early days of Beatlemania, John and Paul still pretty much composed together. “Eyeball to eyeball, nose to nose”-type composing, as John would later call it. But the new song the two composers came up with was not to be the usual Lennon-McCartney collaboration. This was no joint effort, this song was Paul’s baby. It would also become one of the first McCartney “classics.” It was to be very rare in the early canon of Beatle records, in that it is completely sung by just one person- none of the legendary “Beatle harmonies” or any background vocals whatsoever. No, this one was Paul’s and Paul’s alone. John Lennon, never the most reliable source for facts and truth, at least regarding who wrote what in the Lennon-McCartney canon, said in 1972: “Can’t Buy Me Love” was written by “John and Paul, but principally Paul.” Eight years later, John, never one to be shy about grabbing credit when asked again about a song, was to admit “That was Paul’s completely”. “Maybe I had something to do with the chorus. I always considered it his song,” he added. One can easily see the frustration Beatle biographers must feel when relying on John Lennon to locate the truth about all (or any) things Beatles. “Can’t Buy Me Love” was recorded at EMI’s Pathe Marconi Studios in Paris on January 29, 1964. Incredibly, it was done in just four takes, 45 minutes total. Paul’s original “Can’t Buy Me Love” rendition had a Country & Western flavor, as did take two. But eventually, the country angle became less and less used, until it was completely gone by the song’s final take. 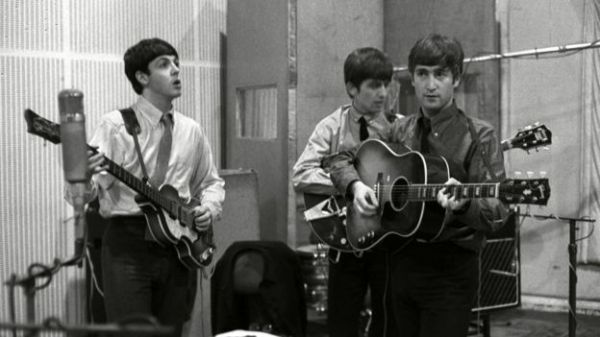 Also, as a demonstration of how loose the early Beatles’ recording sessions were, Paul did not have the lyrics “I’ll buy you a diamond ring, my friend” or “I’ll get you anything, my friend” in the song’s original version. Through the trial and error process, these lines were added during the session and in fully by take four. After the fourth take, the group, as a whole, was not used again. Paul recorded his voice on a free track and George performed a solo on his Gretsch Country Gentleman guitar. On February 25th, Paul and George returned to their home turf, Abbey Road Studios, to add the final touches to the song. Paul double-tracked his vocal and George re-recorded his solo, this time on his new 12-string Rickenbacker. Beatles’ producer George Martin came up with the suggestion that put “Can’t Buy Me Love” into its final form. According to Martin: “I really felt we needed a tag for the song’s ending, and a tag for the beginning- a kind of intro. So I took the first two lines of the chorus and changed the ending.” (This idea of taking the song’s chorus and using it at both the song’s beginning and end was similarly used in “She Loves You”). The critics and those who love to analyze and figure out the “meanings” of Beatle songs came to a different conclusion. According to some, “Can’t Buy Me Love” was about either “prostitutes or lesbians.” One can easily see the logic of these conclusions- wrong as they were. 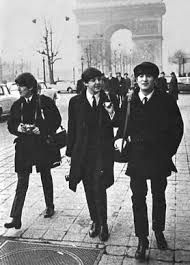 Because it was recorded in Paris, “Can’t Buy Me Love” became the only English language Beatles song ever recorded outside of Britain (the Beatles had also recorded German versions of both “She Loves You” and “I Want to Hold Your Hand” in Paris during this stay). 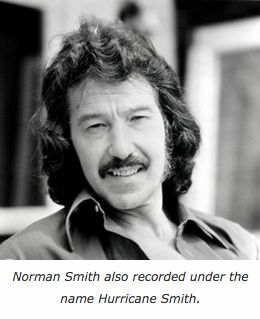 One last little bit of Beatle trivia regarding the recording of song. In his memoirs, engineer Geoff Emerick revealed a rather surprising little anecdote. When the tape that had been recorded in Paris arrived in England at Abbey Road Studios, engineer Norman Smith realized that it had a ripple in it because it had been spooled incorrectly. As a result, there was a partial loss of the treble on Ringo’s hi-hat cymbal. Because the group was absent, there was only one solution- Norman set himself up in the studio and replayed the faulty hi-hat parts himself. As for the Beatles, they never realized it. “Can’t Buy Me Love” was released on March 16, 1964 (four days later in the U.K.). It was to become the Beatles third #1 record in a row. (“I Want to Hold Your Hand” and “She Loves You” had preceded it to the top of the charts in the previous weeks.) 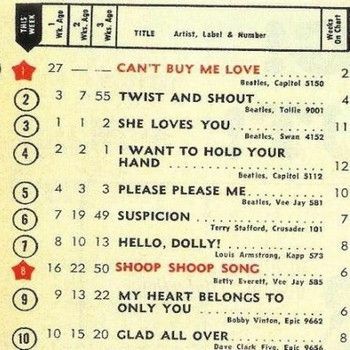 “I Want to Hold Your Hand,” “She Loves You,” and “Can’t Buy Me Love” topped the Billboard charts, one after the other, with no other artist or group having a #1 record in between. The Beatles accomplished this amazing feat five and half decades ago; it has not been duplicated to this day and remains unparalleled. “Can’t Buy Me Love” was to be the number one song for a four week stretch. 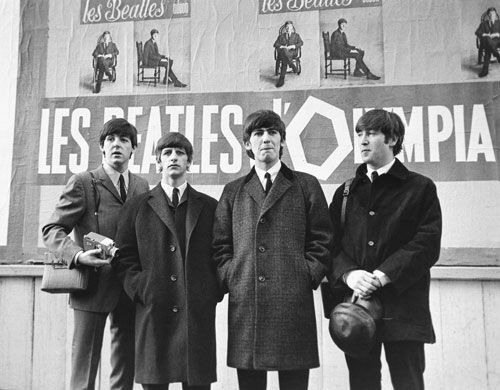 During its second week at the top of the charts, the Beatles had an unbelievable 14 songs simultaneously on the Billboard Hot 100 chart. 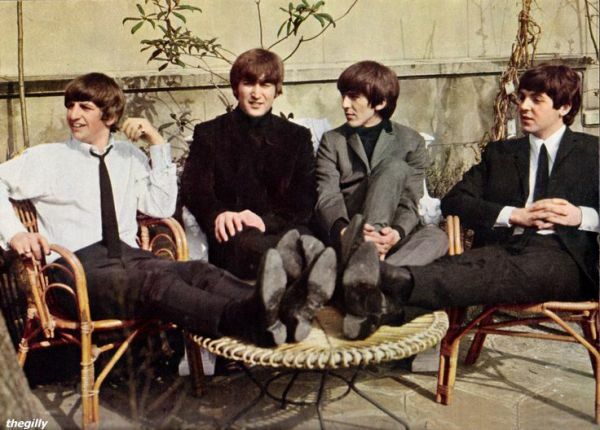 And “Can’t Buy Me Love” had 2.1 million advance orders- another record for the Fab Four. It was to make the jump from #27 on the charts to #1 the next week. At the time, this was the greatest leap of any record from one spot to going #1 in musical history. And this Beatle record stood for 38 years- until the year 2002. In September of 2002, a young singer named Kelly Clarkson released a song called “A Moment Like This.” She had sung the song when she became the first American Idol winner. Kelly’s song made an unbelievable jump- from #52 to #1- in one week, to break the long-held Beatles’ record. “Can’t Buy Me Love” proved to be so popular it was used twice in the Beatles debut movie A Hard Day’s Night, which premiered later that year (1964). 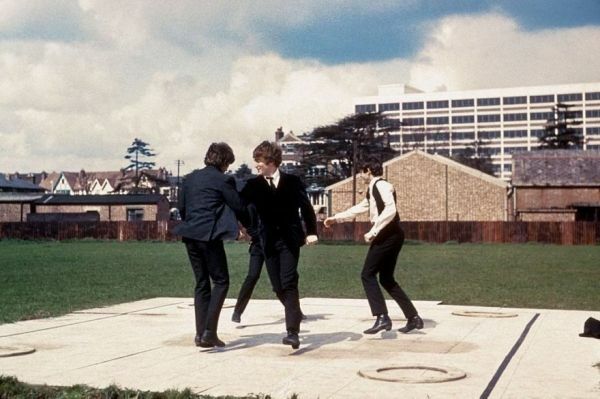 Most notably, the song provided the background music for the scene where the Beatles frolic wildly in the field (the most beloved scene in A Hard Day’s Night and the Beatles’ own personal favorite scene). The famed Beatles stereotype of “John wrote the hard rockers and Paul wrote the sweet ballads” was proven incorrect as early as March of ’64 when “Can’t Buy Me Love” was released. The song was to remain an important song in McCartney’s oeuvre for the rest of his life and career. In 2015, the Beatles (or Paul McCartney, on behalf of the Beatles) donated “Can’t Buy Me Love” to People for the Ethical Treatment of Animals for use in a television commercial. And to this day, these five and a half decades after it was originally composed, Paul McCartney will still frequently include “Can’t Buy Me Love” as a part of his concert lineup the world over. The song’s catchy opening chorus is always met with happy faces of instant recognition. Nostalgia? Sure. But his legions of fans also recognize a great song when they hear one- the first true solo classic in the amazing career of Paul McCartney.